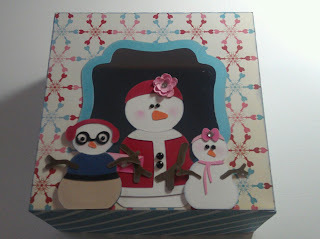 Hi All, My Mrs. Claus cookie box with the online video did so well that I decided to do another. Yup, I am hooked! I can't wait to do more of these and get better. So, This Snowman 6x3 cookie box is my latest workshop at Hearts-n-Crafts etc. using files from SVG Attic. So cute! I want to make a window box, too! Many of you know my Sister-in-Law was recently diagnosed with Breast Cancer. On Facebook someone posted a picture I knew would make a great SVG file so I whipped one up.... You can get the free file by clicking "Here". Would love to see if you make something with it. For the last several weeks I have been playing with the Flower Shoppe cartridge trying to come up with 10 unique flowers for a class I am doing. I am so happy with the results. I am writing up directions for each flower and will post later. Tee and Jearise are collaborating on this hop because they both love The Nightmare Before Christmas and Jack Skellington. Take a ride to Halloweentown as we bring it alive through many creative projects from our awesome line up of crafters/bloggers. Our sponsor for this hop is The Cutting Cafe, who is giving away three (3) files of the winner's choice. You can get qualified for the drawing, which will be held on October 15th, by leaving comments on each blog. The more blogs you comment on the more chances you have to win so please hop through all our bloggers. Now on to Halloweentown... and a quote from Jack Skellington to get you on your way, "Just because I cannot see it, doesn't mean I can't believe it!" Raider Cake - Really Randy?